What’s our mantra this time of year? Be more outdoors! And not just your usual outdoor thing … we want lounge-worthy, linger-worthy, borderline lazy-inducing time spent chilling under the sun and stars. 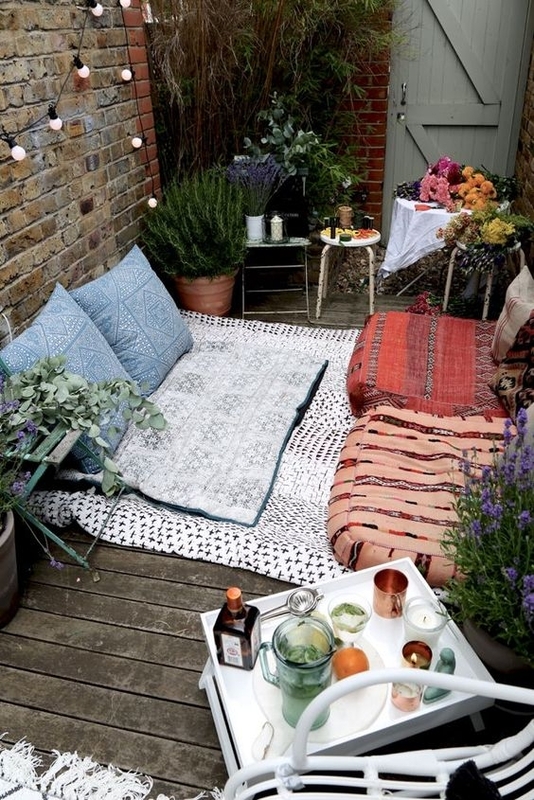 Because we’ve been anticipating lots of “fresh air” design request and are chomping at the bit to refresh our own outdoor spaces, we’ve been busy dreaming up hundreds of ways to style the perfect outdoor setting. To give you a head start, we’ve jotted down a shortlist of 11 chic solutions for patio, rooftop, deck and balcony. With a few fresh ideas and a little help from a Decorist designer, elevating your space will be fun, easy and affordable. There’s something awe-inspiring and inviting about an oversized pendant light. We’re seeing more and more outdoor styles that could easily pass for indoor lighting. Whether you gravitate to clean lines or a decorative Boho look, we’re loving the many macro styles we’re seeing in all the lookbooks this year. Nothing brings the comfort of the indoors out more than a plush, patterned area rug. 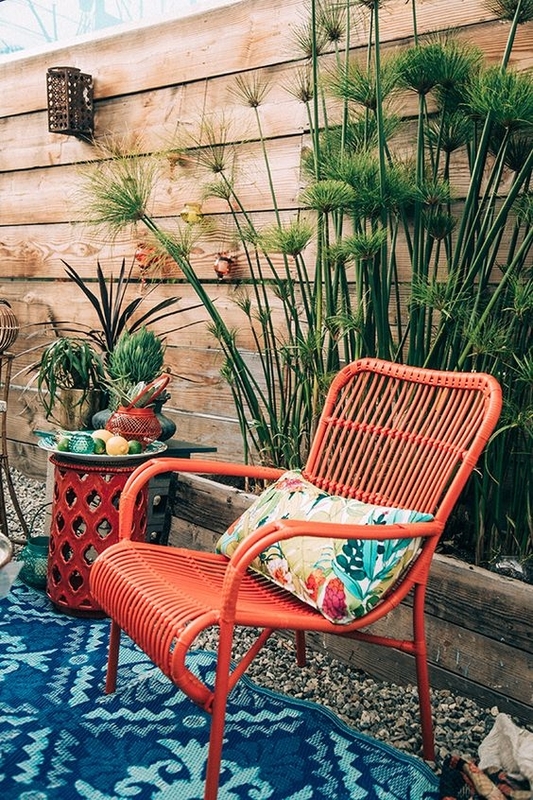 We are partial to outdoor rugs that borrow from colors found in nature, but with a titch more vibrancy. We’re also a lot of textured deeper-pile rugs that are unexpected (in a fun way) in an outdoor setting. 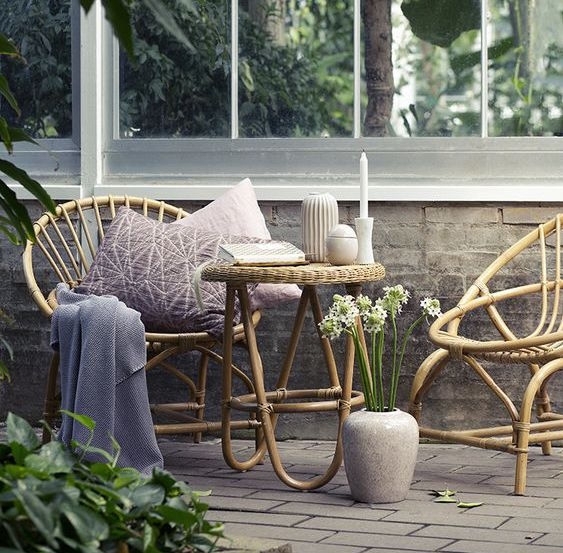 There’s no way to miss the mark with rattan. It gives off a relaxed vibe that instantly says “We’re going to take things a little slower from here on out.” Another winning quality that rattan brings to the table? Texture. Lots and lots of texture. 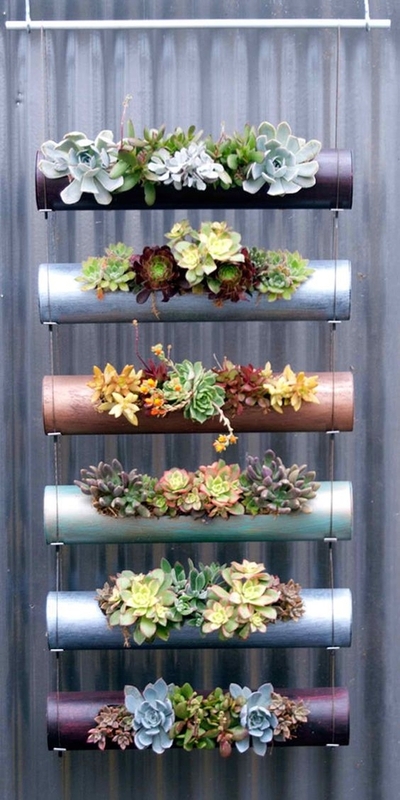 Try adding visual interest to your outdoor space by arranging succulents decoratively. Succulents are easy to take care of and come in a variety of color. The same principle of pillow power applies outside as it does in. The right decorative pillow can tie together even an illogical color scheme and establish the theme of your space. Add graphic contrast by mixing patterns and varying sizes and shapes. Leverage your outdoor garden with a cool container or three. Finding the right color, texture and finish can really elevate your overall look. Playing with contrasting shapes and hues is encouraged, but try to find a motif that is carried throughout the set. Try clustering them together to create a “wall” of greenery. A trend we’re seeing a lot of is the whimsical colorblock woven armchair. Not only are these weather-friendly designs more affordable (usually) than rattan and wicker, they add more architectural interest and invite a little playful color into a monochromatic color scheme. 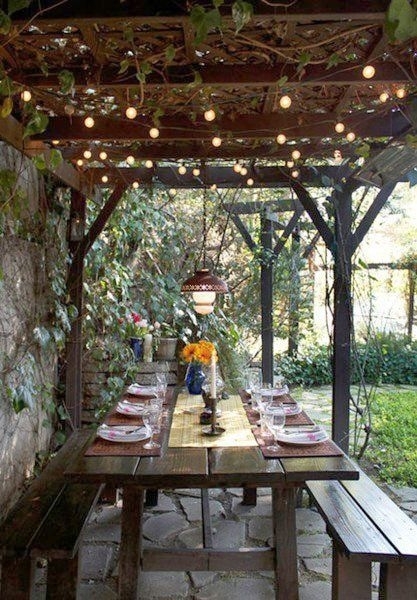 Move your summer dinner parties to the patio where everything’s more atmospheric. 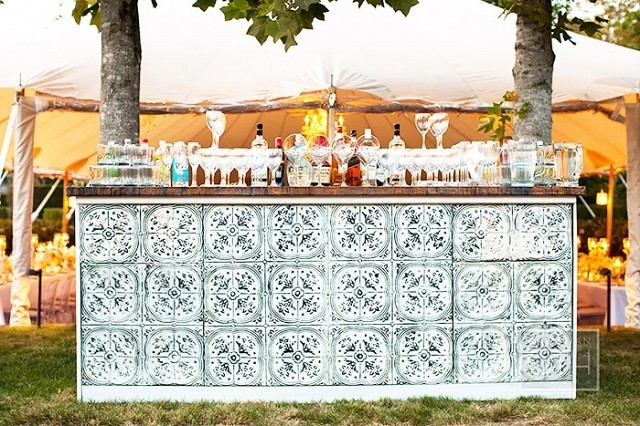 When setting an outdoor table, we like to borrow rustic elements and organic shapes found in nature. Everything should feel light and relaxed, and not too formal or fancy. For all the same reasons we love a pouf inside the home, we think they’re fabulous on a patio too. The pouf is as versatile as it is portable. Use them for surplus seating, as a footrest or an occasional table for stacking your summer reading list or holding serving trays. Throw some shade (in the nicest, chicest way possible). 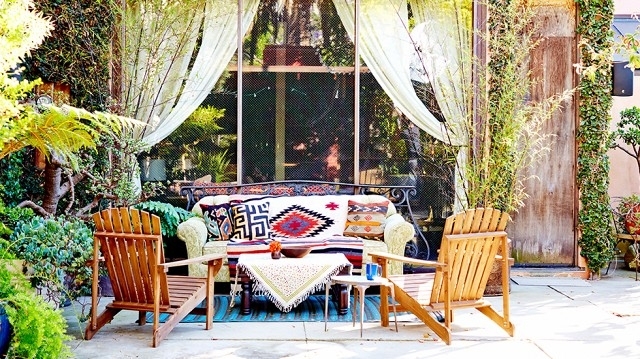 Even if your patio is already well shaded, an umbrella can add a splash of color and a cozy intimacy a seating area. The filtered light coming through the fabric also creates a cool diffused vibe. 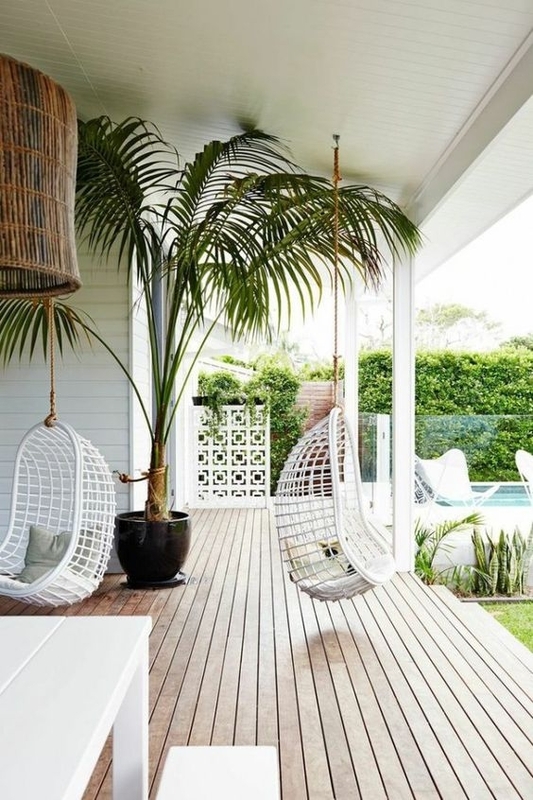 Optimize your seating options with a hammock or hanging chair. We’re loving all the seating-for-one options that have a smaller footprint and allow you to remain upright so you can sip your favorite drink and plug into the lively conversation. If you’re setting your sights on creating a fresh new look for your outdoor space, consider working with a Decorist designer to find all the right pieces and land the perfect outdoor floor plan.